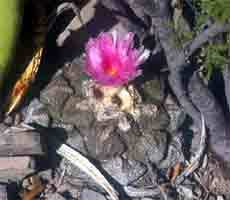 Ariocarpus fissuratus 'lloydii' LRM40, growing in the shelter of low shrubs and Agave lechuguilla. 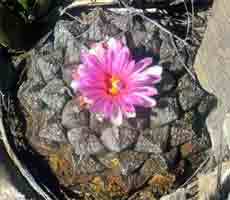 Ariocarpus fissuratus 'lloydii' LRM40,, A large plant growing near Parras. The Parras area is the habitat of A. fissuratus 'lloydii', plants here are of the large growing form with relatively smooth tubercles. 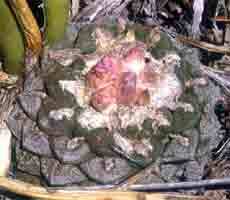 They occur on hillsides in typical Ariocarpus habitat growing with lechuguilla, sheltered under rocks and small shrubs. The population is much reduced due to heavy collection of plants, but a viable population remains, and is reproducing well, if left undisturbed the plant should in time recover to its former numbers.